It isn’t possible to force a market to choose a specific type of device or service, but it is possible to offer options and alternatives. The market today has more choice for the types of devices than ever before. Whether you choose devices like the Apple iPad, Google Nexus, Samsung Galaxy and Microsoft Surface, they all have something in common, portability and touch. The industry has even created an acronym “BYOD” (Bring your own device) to describe the scenarios in which people use these devices today. There is a wide variety of devices that you can adapt and incorporate into your lives, work or personal. It is interesting to note that many companies are still in the state of DENIAL. Organizations state “I won’t allow Windows 8 devices on my network” when they already run Windows XP and Windows 7 in their environment. Meanwhile, their users are sneaking iOS and android devices on their network, devices which are fundamentally different types of devices than the Windows / intel based devices that they currently use. The enterprise must wake up and realize that they can’t stop the influx of consumer devices. When a user discovers a device that is easy to use and conforms to the way they want to work, they are more productive. Clearly people have adopted touch based devices that are easy to use and integrate into their lives. Tablet sales grew 68 percent in 2013, over 195 Million devices sold, including 121 Million Android Tablets, 70 Million iPads and 4 Million Microsoft Tablets. The enterprise can no longer afford to ignore this trend. Microsoft’s 4 million tablets may seem small compared to the Android and Apple powerhouses, yet people are starting to adopt these devices as well. Whether you believe it is a perceived threat from Android, or increased production in Intel processors to create competitive tablets, Windows 8 devices are growing in availability and reducing in cost. Many don’t understand this change in interface direction and have called for Microsoft to lose the “Windows 8” interface. Microsoft won’t reverse course now, as they drive touch and consistency across their device ecosystem. You will start to see Microsoft’s Windows Phone, Tablets, and other devices converge into one consistent experience as Microsoft tries to maintain their presence in the enterprise through devices that allow the end user the use their existing software on touch enabled devices that the enterprise can manage. To understand why the radical change, you will need to think back to the devices in the marketplace prior to the release of Windows 8. Apple had the standout device with touch while the PC OEM Manufacturers had become stagnant and un-innovative. Apple and Android gained and maintained a significant market share by creating extremely desirable devices. Touch changed the market, and now it’s hard to find devices that doesn’t have touch today. There are 8” form factors, touch based e-readers, convertible notebooks, 2 in 1 devices and transforming devices. Combined with the new line of Atom and Core processors from intel, the battery life is now equivalent if not better than the iPad. Even Google has caught on, introducing a line of Touch Based Chromebooks. While the iPad had touch first, the rest of the Apple eco system still does not. The Windows ecosystem of devices has now completely caught up and arguably driven the competition in new types of devices and form factors with touch. It begs the question, why hasn’t Apple added touch to the Macbooks? As Microsoft criticizes Apple for Macs being behind, the Apple loyal are now arguing over whether all Apple devices need touch at all. 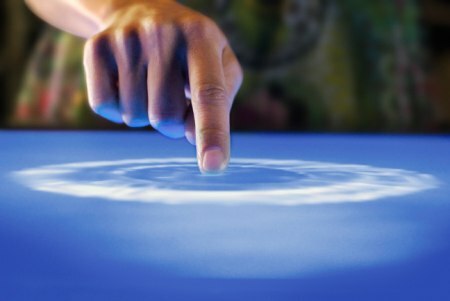 It’s already been decided that touch devices are the Future of Mobile Computing. It’s time to move on to a state of ACCEPTANCE and embrace Bring-your-own-IT. Darren Baker is the Business Development Manager for Sogeti US, focusing on Windows based SMART Desktop Solutions. He helps customers evolve their “Optimized Desktop” vision into the new world of work. He is a public speaker and has spoken on behalf of Sogeti and Microsoft . He manages Sogeti Windows Rangers, and travels throughout the 13 Sogeti operating countries and conducts training for the consultants to ensure Sogeti can deliver cutting edge technology solutions.